Did you know that the number of practicing oncologists barely hits double digits in most African nations? In fact, there are only 13 oncologists in Kenya (all based in Nairobi) for a population of 47 million – that’s one oncologist per 3.6 million people. It’s even worse in Ethiopia, where a population of more than 100 million is served by just four oncologists in Addis Ababa (you don’t need me to do the math). For perspective, consider that there is one oncologist for every 75,000 or so people in the UK. We learnt all this after extensive research into the challenges of access to cancer care in sub-Saharan Africa and it made us realize that the first priority in most sub-Saharan African countries should be to increase the number of oncologists, before discussing investment in infrastructure or drug donations. To that end, Merck KGaA has joined forces with the University of Nairobi to launch a medical oncology fellowship program that provides specialist cancer training to doctors in sub-Saharan Africa. 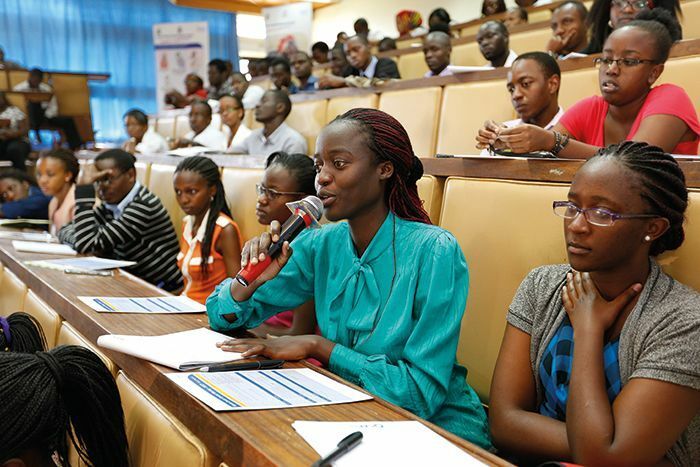 It’s part of the Merck Cancer Access Program, which launched in Kenya, Uganda, and Tanzania at the beginning of 2015, and will fund nine doctors with an advanced degree in internal medicine to take part in a two-year fellowship program at the University of Nairobi. Merck is also sponsoring another five doctors from sub-Saharan Africa to train at Tata Memorial Hospital, Mumbai, India, in pediatric and adult medical oncology. In Africa, the lack of financial resources is never the only challenge. It is sobering to consider that many countries in sub-Saharan Africa have no radiotherapy facilities, especially given that as many as 50 percent of patients with cancer would be expected to benefit from radiotherapy as part of their treatment. But the real bottleneck is the scarcity of trained healthcare personnel capable of tackling prevention, early diagnosis, and management of cancer. For example, when we started our work with the University of Addis Ababa, we soon found that the University needed to expand its oncology set-up – it was the only cancer center in the country, after all. Ethiopia’s Ministry of Health has offered them expansion into a new four-story building for patient chemotherapy – a great opportunity, but with so few trained specialists, it is difficult for the center to take full advantage. Cancer is set to be a huge economic and social burden on Africa. By 2020, the World Health Organization (WHO) predicts there will be 16 million new cases of cancer every year, 70 percent of which will be in developing countries, where governments are least prepared to address growing cancer rates and where survival rates are often less than half those of more developed countries. The numbers represent a massive challenge for African nations, whose healthcare systems are largely built to tackle a very different mix of diseases. Building professional capacity takes a long time but the long-term impact is significant, so I firmly believe that “now” is the right time to start this movement for change. I prefer to use the term “movement” rather than program or initiative because, if applied successfully, it will change the cancer care landscape all over Africa. We have now overcome logistical hurdles to find eligible candidates and develop the program in two locations – University of Nairobi and Tata Memorial Hospital. The two programs target African doctors from all over Sub-Saharan Africa, and we have ensured that after graduation every candidate will be able to practice in his or her own country and in the public sector, so that we can achieve our goal to improve access to cancer care for under-served patients. We have received applications for the fellowship from many African countries, including Uganda, Kenya, Tanzania, Ethiopia, and South Africa. The scientific committee has selected eligible candidates holding a Master’s degree in internal medicine for the University of Nairobi program, and pediatricians for the medical oncology fellowship in India. According to WHO, 30 percent of cancer cases can be prevented, and another 30 percent will respond to basic treatment if detected early, so having trained experts will provide great support. Africa is an important region for Merck and we have a number of other initiatives ongoing to help cancer patients in the continent. We will shortly launch our “Merck More than a Patient” campaign, which aims to empower female cancer survivors in Africa; it helps them to establish small businesses so that they can generate a good monthly income to support themselves and take a full role in society. The new campaign follows on from our “Merck More than a Mother” campaign, which we hope will help infertile African women, who often face stigma and social isolation. Clearly, cancer is not the only problem facing African healthcare systems. But by running campaigns that target the common risk factors behind several non-communicable diseases, such as tobacco use, alcohol abuse, unhealthy diets and physical inactivity, we can cost-effectively target cancer alongside other diseases on the rise in the region, such as diabetes and cardiovascular disease. In reality, even with more oncologists and better treatment, cancer isn’t always curable, so there is a need to make palliative medicines available at affordable prices. Without access to palliation, most cancer patients in Africa would die in severe pain – an important humanitarian element for cancer care on the continent. 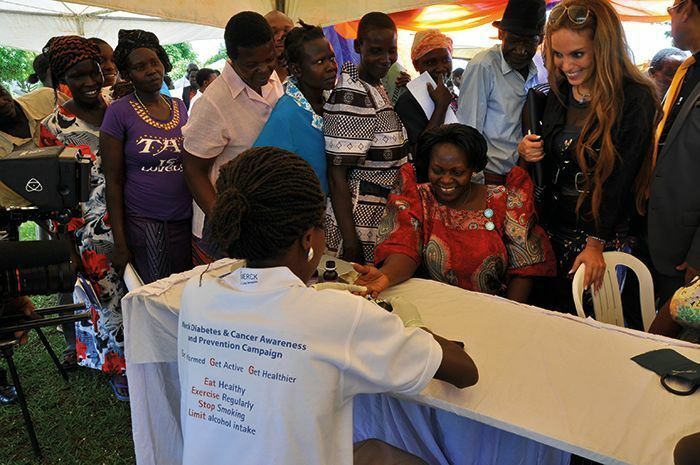 Rasha Kelej (right) and Ugandan Minister of Health Sarah Opendi (center) with patients at a Merck combined cancer and diabetes campaign. I firmly believe that the only way to effectively prevent, detect, and treat the rising number of cancer cases in Africa is through public–private partnership models that involve health ministries, NGOs, academia, patient associations, and industry. The size and complexity of the task is so great that no single organization or institution can manage on its own, so integration of efforts is vital to achieve the health gains that our citizens deserve. I believe that prevention is better than cure, so awareness-raising and education will play a big part in any campaign to reduce death rates, but we also need to improve access to basic cancer treatment and palliative care. By partnering with ministries of health and universities in Africa to implement our Cancer Access Program, we hope to rapidly achieve our objective of advancing cancer healthcare capacities and reducing the socioeconomic burden of the disease. Now is the time to take action, and we hope other companies will join us in supporting healthcare systems in Africa as they face this emerging challenge. Rasha Kelej is Chief Social Officer for Merck Healthcare. We spoke with Isaac O. Kibwage, Professor and Principal of the College of Health Sciences, University of Nairobi, to get his view on the partnership with Merck and the future of cancer care in Kenya. How did you become involved with the fellowship program? Rasha and I were speaking about emerging diseases that are increasingly impacting Kenya. One of the diseases that our government is already taking urgent steps to address is cancer, with investment into better facilities and access to care. We discussed our plans for training oncology specialists and Rasha raised the possibility of Merck joining us in the venture. Now, we have formalized the partnership, with Merck providing funding for students from Kenya and other African nations to take part in an oncology fellowship program here at the university. How did you decide where to focus your efforts? You have to start with the human element. Even if you have adequate equipment and drugs, if there are no specialists to diagnose people or oversee their treatment, you won’t get far. The lack of oncologists in Kenya has led to two key problems; first, the quality of diagnosis is very low, and second, patients cannot access specialist care, especially outside of the main cities. If we can train enough oncologists to provide high-quality cancer care around the country, we will be able to help our own citizens, and even welcome medical tourists from elsewhere in the region. To take part in the fellowship at University of Nairobi, candidates must already be internal medicine specialists, as the need is urgent and these students will be the fastest to train. Why are cancer rates going up in Africa? Cancer cases are increasing all the time. We speculate that this relates to changes in lifestyle – we are more sedentary, eat more refined food, and have more environmental pollution than our ancestors. Also, more cases are identified as better diagnosis becomes available. Why are there so few oncologists in Africa? Historically, cancer has been less common, so there was limited demand. In addition, some doctors have told me that the high mortality and morbidity rates made it a less appealing area, as even specialists could do little to help patients. Now that we have the means to treat and even cure some cancers, there are more doctors gravitating towards the field, but training opportunities have been scarce. *The author has given permission to use the article as is for publishing on your website/blog.